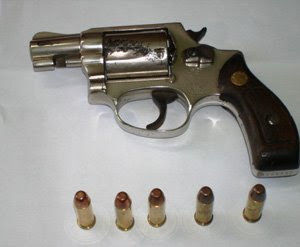 Keon Fyfield of Taylor’s Village was found with a .38 revolver on his person; an offence for which he was taken into police custody, officially arrested and charged. “On Sunday, March 16, 2008 Police conducted search operations in the Basseterre area for controlled drugs, arms and ammunitions. A number of vehicles were stopped and searched as well as abandoned houses at Fort Thomas Road and Ponds Pasture. A group of young men, who were in the abandoned house at Ponds Pasture, was also searched. Keon Fyfield of Taylor’s Village, who was at the house, was searched and one .38 Revolver and five rounds of ammunition were found in his pocket. The weapon and ammunition were taken into police custody and Fyfield was arrested and charged for “possession of firearm and ammunition”. Police, during another operation conducted on Sunday, were able to prevent a number of marijuana plants from hitting the streets of the Federation. They have informed however that no one has been made accountable for the find. The other three operations were conducted on Friday last and, as a result, two men were arrested and charged and quantities of marijuana were taken into custody. “The Security Forces executed search warrants on a number of premises on Friday…for controlled drugs, arms and ammunition in the Basseterre and Molyneaux area and discovered a quantity of cannabis at the home of Rueben Govia of Molyneaux and 90 marijuana plants growing on the premises of Sylvester Lee of Upper Fiennes Avenue.